The most valuable earrings at auction, ever. 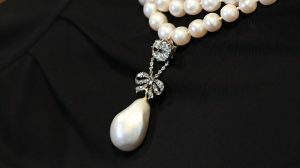 THE most valuable earrings ever to appear at auction comes up at Sotheby’s in Geneva on May 16. 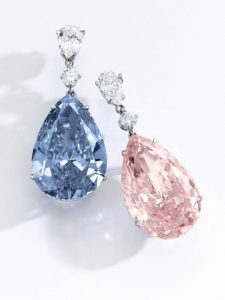 The Apollo and Artemis diamonds, one Fancy Vivid Blue, one Fancy Intense Pink, are to be offered separately as individual lots. The Apollo Blue, internally flawless and 14.54 carats, is estimated at US$38-50 million, the 16 carat VVS 2 clarity Artemis Pink at US$12.5-18 million. 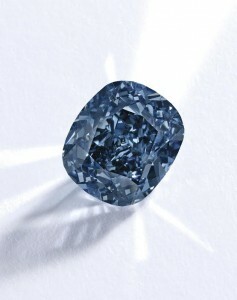 The Apollo Blue is the largest internally flawless fancy vivid blue diamond ever offered at auction. UPDATE: They sold for a combined world record total of $57 million. They were renamed The Memory of Autumn Leaves ($42 million) and The Dream of Autumn Leaves ($15 million). The auction realised $151.5 million. The 8.01 Sky Blue Diamond: UPDATE: IT SOLD FOR $17.1 MILLION. 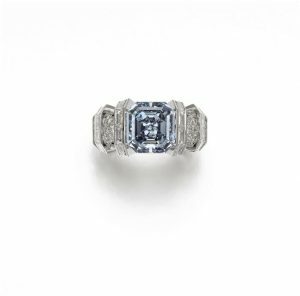 A rare Fancy Vivid Blue diamond ring by Cartier will be the centrepiece at Sotheby’s November auction of Magnificent Jewels and Noble Jewels in Geneva on November 16. Weighing 8.01 carats, this mesmerising stone has been named ‘The Sky Blue Diamond’, emphasising its highly sought-after hue. The estimate is US$15 – 25 million. Fancy Vivid Blue is the highest possible colour grading. It is awarded to no more than 1% of blue diamonds submitted to the Gemological Institute of America. Sotheby’s has twice set a new world record auction price for a blue diamond within the past two years most recently with the only diamond or gemstone in auction history to have exceeded $4 million per carat, the Blue Moon of Josephine. This sold for $48.5 million ($4,028,941 per carat) in November 2015. 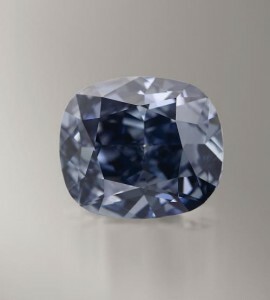 The 12.03 carat internally flawless fancy vivid blue diamond The Blue Moon of Josephine. A Hong Kong private buyer set a new auction record for any diamond when he paid US$48.5 million at Sotheby’s in Geneva last night for a 12.03 carat blue diamond. It was promptly named “The Blue Moon of Josephine”. This was a record for any diamond of any colour, or any gemstone. The price per carat for this internally flawless stone works out at US$4,028,941. This is the first time any gemstone has reached over $4 million per carat. The sale last night of magnificent jewels and noble jewels brought in US$139,085,346. The previous auction record for any diamond was held by The Graff Pink (24.78 carats), which sold for US$46.2 million at Sotheby’s Geneva in 2010. The Blue Moon Diamond – among the largest fancy vivid blue diamonds known – will be the centrepiece at Sotheby’s auction of Magnificent Jewels and Noble Jewels in Geneva on November 11. It weighs 12.03 carats and has been graded Fancy Vivid Blue – the highest possible colour grading for blue diamonds — by the Gemological Institute of America (GIA). Internally flawless it comes to market with an estimate of $35-55 million.